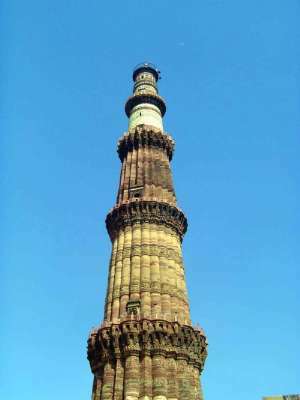 The Qutb Minar or "victory tower" is part of the Kuwwat ul Islam, "the Power of Islam" Mosque. 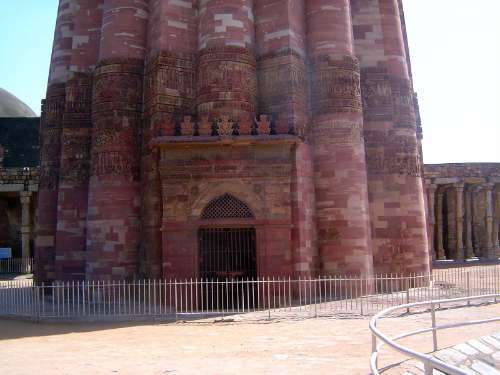 The ensemble was built to commemorate the capture of Delhi by Muslim forces in 1193 and was built on the site of an older Hindu temple, destroyed by the conquerers. The tower has the feel of Hindu architecture because its stones were mined from more than 20 temples levelled by the conquerers. Khushwant Singh, a novelist whose father was a contractor during the construction of New Delhi, laments the "long traffic jam" that now stretches south from the city to the Qutb: "I used to cycle from the Safdarjung tomb to Qutb Minar without seeing one person, just herds of deer." That's what happens when 15 million people converge. 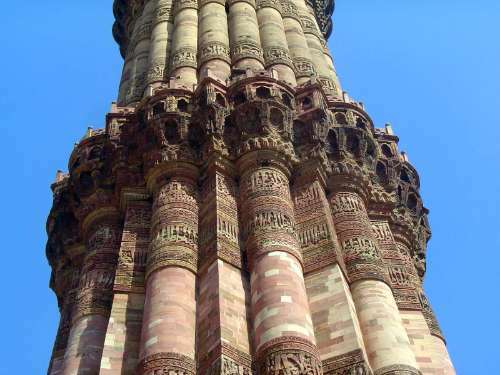 Despite the flutings, the tower, made of red sandstone, is approximately circular. The gate, leading to interior stairs, has been closed since a fatal stampede. Interior stairs reach to four elaborately corbelled balconies en route to the top. The two top stories are cylindrical and of marble. The view from up there--at the top, about 240 feet high--looks over the extensive ruins of several ancient cities. The "Old Delhi" that the British knew lay a few miles to the north and was established by that latecomer, the Mughal Shah Jahan. 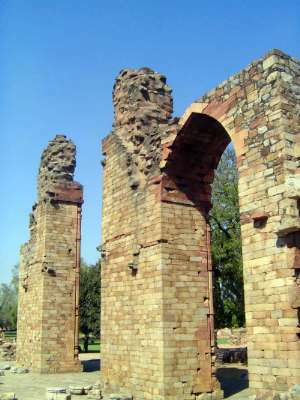 The adjoining ruins of the great mosque have fared much less well. A good sampling of adaptive, albeit unwilling, reuse. 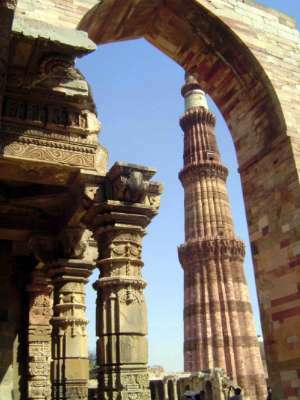 Columns from a Hindu temple have been incorporated into the Qutb complex. 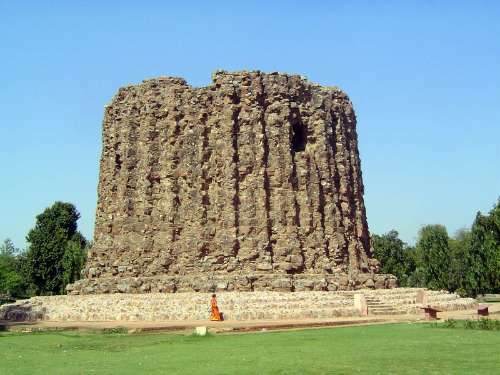 The unfinished Alai Minar, intended to be twice the height of the Qutb Minar but abandoned in 1316 at the death of Alauddin Klalji. 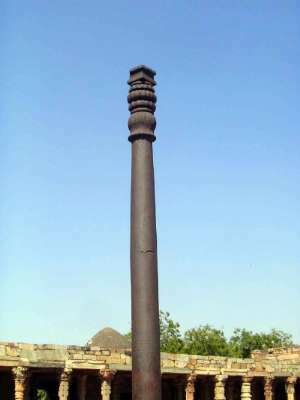 A solid iron shaft 24 feet tall. 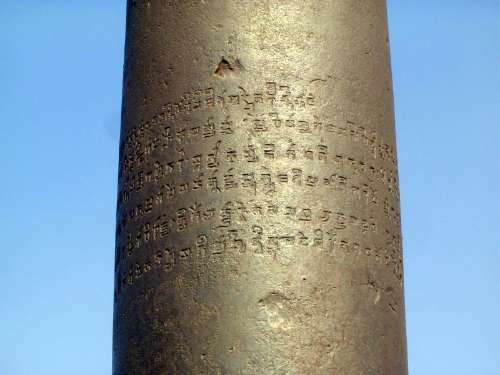 A Sanskrit inscription suggests that this remarkably rust-proof mass originally stood in front of a Vishnu temple located somewhere in front of a mountain, perhaps in 5th Century Bihar, hundreds of miles to the east. It was placed here, in front of the Quwwat al-Islam mosque, as a symbol of the defeat of Hinduism. Partial translation: "He, on whose arm fame was inscribed by the sword, when in battle... the king who attained sole supreme sovereighty in the world... having the name of Chandra, carrying a beauty of countenance like the full moon... having in faith fixed his mind upon Vishnu... this lofty standard of the divine Vishnu was set up on the hill called Vishnupada."